Yikes! What have I myself gotten into. I joined the forum in May asking about a cafe racer project I was thinking about starting in on,,, had a setback or two over the summer that put things off,,, and I am just getting back into the swing of things. I am a NOVICE in the truest sense with goldwings and motorcycles,,, so I am really really hoping people will help walk me thru some of the most elemental things until I can get my bearings and more familiar with the goldwing systems and the directions I am going to need to go. I am mechanically inclined, currently restoring a 1986 Porsche 928, a 1990 Jaguar XJS V-12 Convertible and my daily driver is an older Jaguar XK8 that I brought back to life. BUT,,, I know the Goldwing is a whole nuther animal and I will be needing you allz help here. 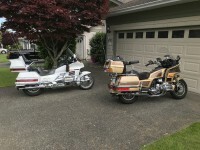 My neighbor sold (basically gave) me a 1986 Honda Goldwing Aspencade with 12,500 miles on it. It starts right up and runs pretty smoothly. Coughs and hesitates quite a bit when I give her throttle... Still, she is surprisingly clean. I want to craft, shape, convert and mold it into a cafe racer of my very own. I dove in today. I have a new battery coming. The old battery will not hold a charge BUT it will start with one of those mobile jumpers. That was, until I started pealing of fairings. Basically I removed the entire front faring. Before I removed it she would run after I jumped her WITHOUT the cables attached, and after, she would only run IF I left the jumper cables attached. If I removed the jumpers after removing the fairing she dies right away. As you can see from the photos (sorry they are sideways) when all was said and done removing the front fairing, I ended up with 4 plugs that did not have a home. When sitting on the bike they are on the left hand side. 3 of them, the white plastic, seemed to be involved in radio controls,,, maybe??? And that one 4 port brown connector I cannot find a place for. What would be the cause in change after removing the fairing? Are any of these plugs the return to the battery from the alternator? 1. THE THREE WHITE PLUGS IN MY HAND PLUG INTO THE FAIRING IN THE PHOTO. 2. THAT BROWN 4 POINT PLUG IS THE ONLY PLUG THAT WAS LEFT OVER AFTER REMOVING THE FAIRING. I CANNOT FIND ITS OTHER HALF EITHER ON THE FAIRING OR ANYWHERE ON THE BIKE. ALL of these photos are on the left hand side of the bike when sitting on it. All the images show up sideways...? I have an 85 Interstate (which I know is different from the Aspencade, but not a lot for the issue you're having) There appears to be some kind of module on mine and also wiring that plugs into the Fairing harness. I would suggest you get your hands on the wiring diagram for the bike and trace through what is in the fairing and what you can substitute or not. I would be careful running the bike without a good battery, the local guy here that I talk to in combination with reading these blogs tells me running the system on a bad battery or no battery can cause a lot of damage to the charging system, which if you blow the charging unit on your engine, you have to pull the engine to replace it, can become very costly, better to buy a battery with the possibility of it not lasting you, than to cause expensive damage to your project. Been following the thread, always new information to be gleaned from one. The connectors in your hand plug into the connectors on the side piece. These are for the front fairing where ever it is, for items such as signal lights, clearance lights, dash, headlight and the likes. I have the brown connector on my '85 LTD as well, not hooked up to anything. Was told what it was for, but have since forgotten. It has never been hooked up. You probably already have read about recommendations to do immediately and down the road a bit. Won't reiterate. You should get an OEM service manual. Will save a lot of heartache. The saving grace is these bikes along with the engines are quite robust and can be brought back from the abyss.